One-of-a-kind beer brewed without wheat or barley: the first of its kind that can be enjoyed by those with Celiac Disease. This is the first gluten free beer to be granted label approval by the US Government. Each batch we brew is tested for its gluten contents before it is bottled and shipped. New Grist is brewed from sorghum, rice, hops, water and yeast. These ingredients are carefully combined to form a crisp, refreshing "session ale" brewed for those on a gluten-free diet, or anyone with an appreciation for a great tasting, handmade beer. It pours a brilliant gold color, with a bubbly head and light, fruity aroma. The flavor is crisp and refreshing, fruity and smooth at the same time. Hints of green apple slice through the maltiness of the sorghum, making this an extremely quaffable beer. This unique stout combines the flavor of organic roasted malts and Milwaukee’s renowned organic Fuel Café coffee. Pours a deep, dark color with a beautiful creamy tan head. Coffee aromas dominate the nose, with a background of roasted malt. The fine balance of mild organic hops, gentle brightness of choice coffee and the full mouthfeel from roasted malted barley make this an unforgettable brew. 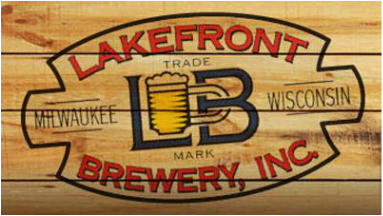 Inspired by the energy and audacity of the fixed gear courier, Lakefront Brewery ran smack into this arresting creation. Fixed Gear is a big, bold American red ale. It pours a glaring crimson tone with a rocky white head and a brilliant floral-citrus aroma, thanks to an aggressive dry hopping. Its immodest, malty spine and intrepid caramel flavors blow in via gratuitous amounts of 2-row pale and dark caramel malts. A balanced citrus bite comes from Chinook and Cascade hops followed shortly by mild, fruity esters from the ale yeast. Weighing in at a mean 6.8% ABV and 54 IBU's, this one's got an attitude. Our version of a Belgian classic, brewed with wheat malt and spiced with coriander and orange peel. Pours a beautiful hazy blond-gold with a thick pearly white head. The nose is yeasty with a light aroma of fruit and spice. This beer is as crisp and refreshing as the aroma implies, with the wheat malt supplying a full, somewhat sweet background to the orange and coriander flavor. Spritzy carbonation lifts the sweetness to lend a crisp finish. A great beer for a warm summer day. Sometimes you need an IPA that goes the distance. That’s why we put together Extended Play. This is an India Session Ale, which means all the hoppy goodness of a legit IPA, but with less alcohol. Huge citrus and floral aromas greet the nose from the stacks of Citra and Cascade hops added toward the end of the boil and in the whirlpool. The flavor is extremly citrus forward with just a touch of light caramel malt, giving way to a mild, hoppy finish, coaxing yet another sip. In short, it’s a beer that bears repeating. Beer Line is an off-the-rail barley wine style ale: rich, malty, multi-layered, and copper-amber. The off-white head liberates aromas of strawberry, dried-fruit, grapefruit, and papaya. The smooth, malt-forward flavor is equally complex, with undertones of caramel and toffee. Not overly sweet by any means, organic Bravo hops balance the malt syrup sweetness, finishing slightly spicy with a pleasurable alcohol warmth. Our version of a winter warmer: brewed with cinnamon, orange zest, clove and generous amounts of honey. Pours a deep amber to ruby color with an off-white head. Aromas are fruity and spicy, with a slight floral undertone from the lager yeast. The flavor is smooth, full and spicy, balanced by the bite of Mt. Hood hops and a substantial, warming alcohol character. This is a full bodied beer, making it a holiday taste sensation that will warm your bones on a cold winter night. We brew just a few batches of our Big Easy Lager every year to celebrate Mardi Gras. Don't be fooled by this beer's light color: at 7.6% ABV, it is deceptively easy drinking. Pours a brilliant blonde-gold with a bright white fluffy head. Malty aromas blend with German noble Hallertauer hops. The flavor is bold and malty, with a robust sweetness provided by ample amounts of Munich pale malt that continues to the clean finish. Pairs well with Cajun, or any spicy food. A rounded hop flavor and crisp carbonation lift the spiciness of gumbo and jambalaya, while the substantial body stands up to the richness of dishes like etouffee. The sweetness can almost even pair with caramely pralines.